These easy-to-use 8-pin integrated circuits contain all of the features needed to develop an IEEE 802.3af compliant powered device (PD). The GI3206H family is a second generation PDC (PD Controller) featuring 100-V ratings and a true open-drain, power-good function. In addition to the basic functions of detection, classification and under voltage lockout (UVLO), these controllers include an adjustable inrush limiting feature. 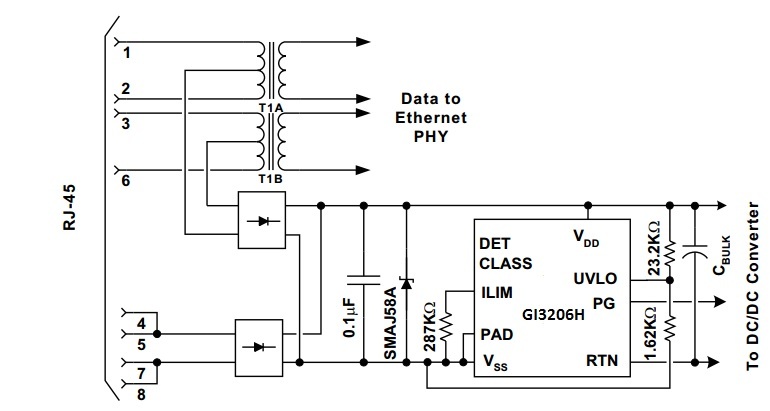 GI3206H has a programmable UVLO with a dedicated input pin. The GI3206H family specifications incorporate a voltage offset of 1.5 V between its limits and the IEEE 802.3af specifications to accommodate the required input diode bridges used to make the PD polarity insensitive.